The podiatrists will provide you proper treatment as well as information regarding the particular foot and ankle disorder so that you can aware about the issue. Literally, you should also keep some points in mind so that you can pay more attention to your foot. You can even prevent different problems if you take care of your feet pay a little more attention of your foot during the regular work outs. With even a 10 to 15 minutes training and exercise you can keep several disorders away. The people who are facing weak feet and ankle condition are prone to grow foot muscle cramp or lock up in a spasm. Skin irritation and friction. Patients with numbness cannot tell and find it difficult when they have skin irritation, problems with frictions or pressure points. The only way to know for sure is to check the condition of the feet often for redness, peeling skin or blisters. Prevention, prevention, prevention is the best solution to it. Diabetes wound is all about caring and preventing. Untreated wounds can lead to infection and expose to risks even to losing of lives. The quicker it is treated, the less likely it is to develop a problem. Diabetics need to keep the toenails trimmed properly but not too short. Long toenails are difficult to keep clean underneath, which can cause infections of the feet. If you’re not able to care for your toenails, make regular appointments with a podiatrist or foot specialist to help in the care of your toenails and feet. Keeping your toenails healthy and trimmed will detour any swelling from developing in the feet due to infections. 5. If the Shoe Fits, the Diabetic Can Wear It Socks made of an acrylic blend are well suited but avoid mended socks or those with seams, which could rub to cause blisters or other skin injuries. B) Fastening your shoe with laces or velcro- Shoes with laces let you adjust your shoe’s fit, especially if your foot swells that will change the shape of your feet If you are a diabetic walker you must have a proper fitted walking shoe. If you have no history of foot problems or with any loss of feeling ( diabetic neuropathy) in your feet you still need a properly fitting walking shoe. A shoe insert that is made of soft material for diabetics is something for you to consider. They balance you foot and the shoe when you are doing your exercise. Having patients use a wheelchair or crutches to completely halt weight bearing on the affected foot is the most effective method of offloading to heal a foot ulceration. Total contact casts (TCCs) are difficult and time consuming to apply but significantly reduce pressure on wounds and have been shown to heal between 73 and 100% of all wounds treated with them. Armstrong et al. 4 have achieved similar healing rates with an “instant TCC,” made by wrapping a removable cast walker with a layer of cohesive bandage or plaster of Paris. Even without foot malformations that create friction, poor fitting shoes can be a cause of diabetic foot sores. The American Diabetes Association recommends that you wear shoes that fit correctly over the toes and heels to reduce the amount of friction and pressure. Pressure over the toe area can result in hammertoes and ingrown toenails, both of which can lead to pressure ulcers or sores on the feet. Poor Circulation Hallux valgus feet, shoes, one arch of the foot pad of Riga. Toe valgus is a common problem in many high heels lovers, one arch of the foot pads pad will improve the condition. For people with diabetes, the feet are a particularly sensitive area-and not just because diabetic neuropathy can make them tender. PWDs often worry about foot complications. 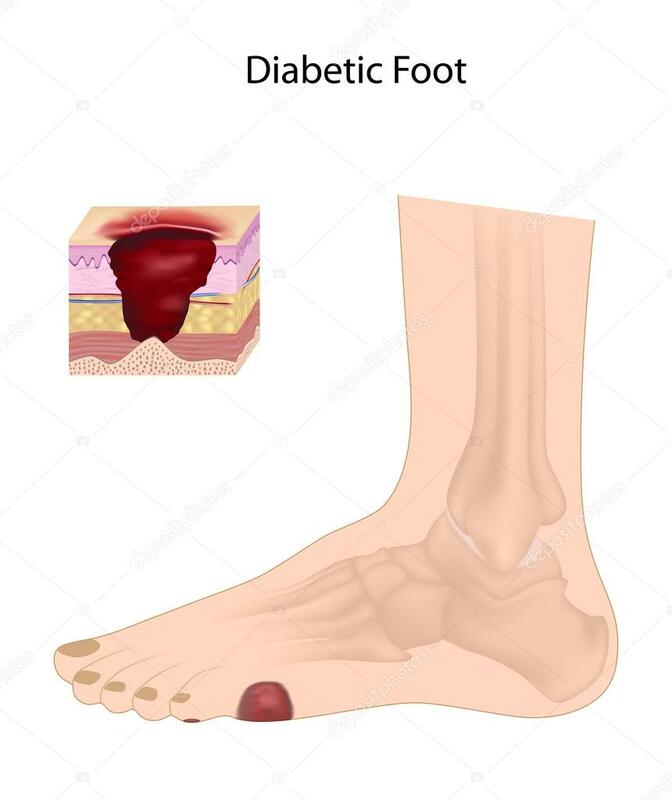 The good news is that thanks to better blood glucose control, the number of diabetic foot amputations has significantly decreased. But it’s important to catch foot problems early. Check out these common foot problems. If any look familiar, contact your health-care provider. These conditions put diabetics at a much greater risk of serious problems which, if untreated, can even lead to amputation. Thousands of patients rely on our physicians for prevention, early diagnosis and treatment of diabetic foot problems. Diabetes can be dangerous to your feet—even a small cut could have serious consequences. Diabetes may cause nerve damage that takes away the feeling in your feet. Diabetes may also reduce blood flow to the feet, making it harder to heal an injury or resist infection. Because of these problems, you might not notice a pebble in your shoe—so you could develop a blister, then a sore, then a stubborn infection that might cause amputation of your foot or leg. To avoid serious foot problems that could result in losing a toe, foot, or leg, be sure to follow these guidelines. If your thinking about buying a treadmill, there are plenty of thing you should know, here we take a look at two basic things you need to know before deciding about your purchase. A lot of people wonder if buying a treadmill that will fold away is a good idea or not. To answer the question for you, we are going to have to go a little deeper before we can give you a logical answer. Most people ask them selves “What am I giving up something to have the capability of the treadmill to fold?” So, let’s take a look at that first.